New Delhi: Dr Kafeel Khan, whose name surfaced in the death case of 63 children at Gorakhpur’s BRD Medical College, launched a campaign on Tuesday along with health activists from across the country to pursue political parties to give priority to health issues in their manifestos for the Lok Sabha elections. Khan said he will be meeting all political parties with health policy proposals and will support the party which would promise to work for those. The campaign, ‘Health For All’, focusses on access to good quality healthcare services without anyone having to face financial hardship irrespective of age, caste, religion, region, gender, disability or economic status, he said. “The government should provide affordable, adequate health services that are new and acceptable for its citizens. These services include free consultation, drugs, diagnostics and free emergency care services in all public hospitals. Public health expenditure should be increased to 3 per cent of the GDP. The total health budget should be doubled to Rs 1.5 lakh crore every year for the next five years,” he said. The other demands include filling up the 1.5 lakh existing vacancies in the healthcare and creation of new jobs every year. Khan is one of the nine accused in the case involving the death of 63 children within four days due to disruption in the supply of oxygen at the Baba Raghav Das Medical College in Gorakhpur in August 2017. He was arrested by the Uttar Pradesh Police in September 2017. He had recently filed an RTI on the BRD Medical College incident and he claimed the UP government, in its response, accepted “there was shortage of liquid oxygen for 54 hours in BRD medical college on August 10, 11, 12, 2017 and Dr Kafeel Khan indeed arranged jumbo oxygen cylinders to save dying kids”. 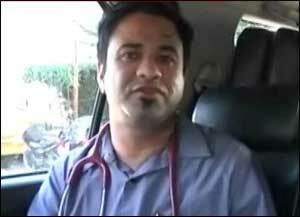 Another RTI filed by him revealed that he was the junior most doctor. “I joined as a lecturer by permanent commission only on August 8, 2016, and neither was I heading the encephalitis ward nor was I the vice principal,” he said, quoting the RTI response. He demanded a CBI probe into the tragedy which claimed the lives of 63 children and to transfer the case out of Uttar Pradesh as those responsible for the “massacre are still at the helm and they only are heading the current inquiry”. He said he will either approach the High Court with a review petition about his case or the Supreme Court against his suspension. The Allahabad High Court had granted him bail in April last year.